There are two established sources of journal ranking data. The Journal Citation Reports (JCR) from Thomson Scientific (formerly ISI) and the journal rankings from Scopus (Elsevier). Select Analytics tab for the journal analyser facility. This shows citation information over several years. The SCImago Journal and Country Rank portal provides an easy to use Journal Indicators facility based on Scopus data. Publish or Perish is a free software program that uses Google Scholar as its data source. The UK Association of Business Schools produces an Academic Journal Guide. Journal Quality List from Anne-Wil Harzing. 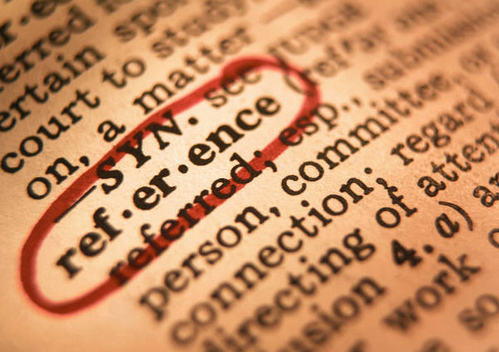 The University of Manchester Library’s Citation Services offers additional information on this and related topics. See other posts about journal ranking. 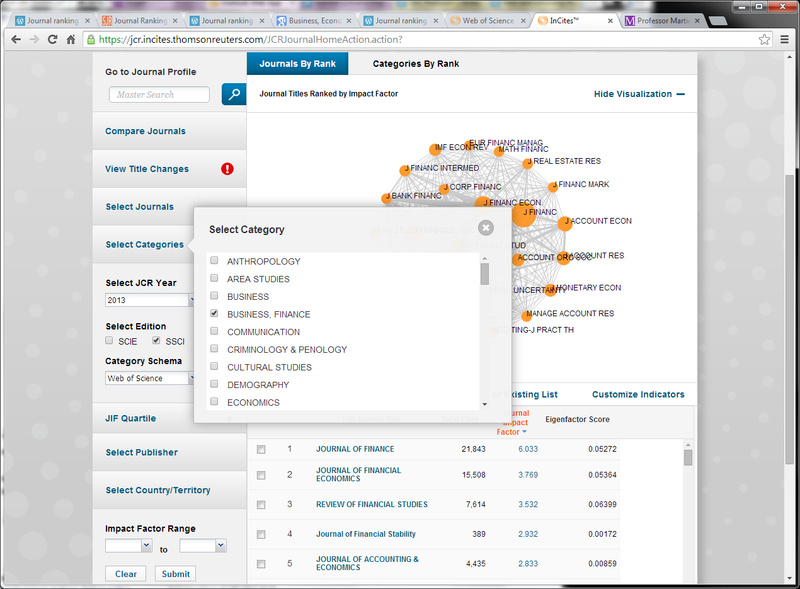 The best known journal rankings are the Journal Citation Reports (JCR) from Thomson Reuters. These are not available for free – staff and students from University of Manchester have access through our Web of Science (formerly Web of Knowledge) subscription. Select the Journal Citation Reports link or select Web of Science and then the Journal Citation Reports tab. Once at the JCR home page select the Journals by Rank tab. The primary variable calculated by JCR is the Journal Impact Factor (JIF). The new interface also offers a journal connection visualization. 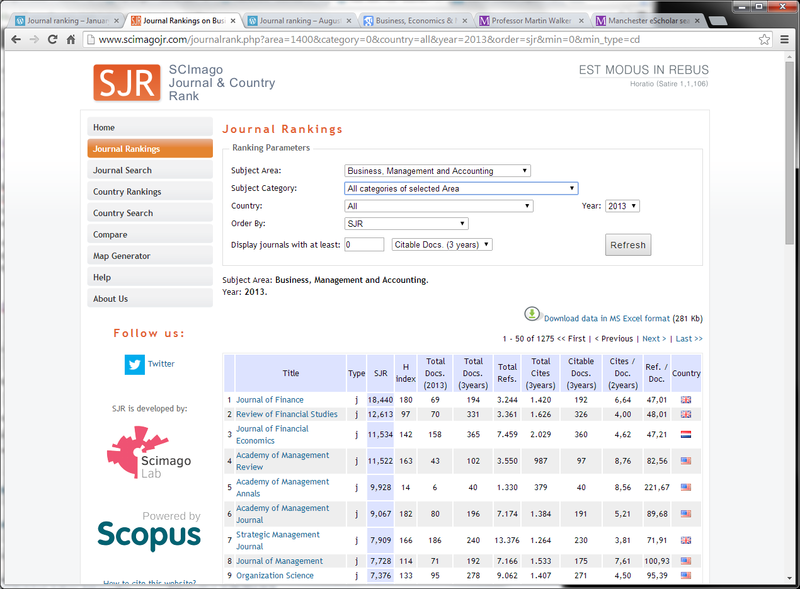 The SJR SCImago Journal and Country Rank – Journal Ranking, based on Scopus data, now have 2013 as their latest year. The SJR indicator, developed by SCImago, is not as well know as the JIF factor from the Journal Citation Reports. However the metrics are freely available – they are based on Scopus rather than ISI Web of Science so more business and management journals are covered, and more business and management subject categories. The screenshot below shows results for the subject area Business, Management and Accounting. There is a category Marketing in this subject area (see Journal ranking – marketing posted August 2012). 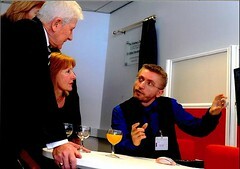 The subject category Finance is in the separate subject area Economics, Econometrics and Finance. The CWTS Journal Indicators are also based on Scopus data, and again 2013 is now the latest year available. Google Scholar does not appear to make historical metrics available. There is an example screenshot in the Journal Ranking – August 2013 update post. Thanks to the Academic Trends & Innovation blog for the latest JCR released post – a reminder that the Journal Citation Reports (2014 edition) is now available. For information on the journal rankings including 2013 data see Journal ranking – August 2104 update. 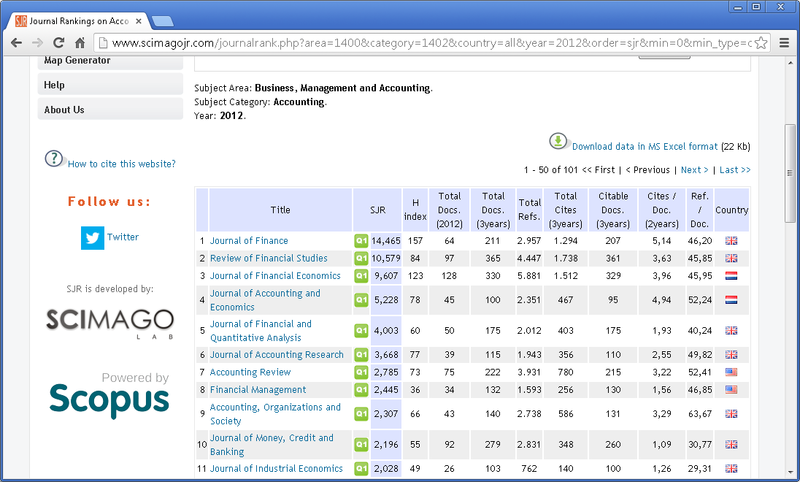 The SJR SCImago Journal and Country Rank – Journal Ranking, based on Scopus data, now have 2012 as their latest year. The SJR indicator, developed by SCImago, is not as well know as the JCR (Journal Citation Reports), including JIF (Journal Impact Factor), from ISI Web of Knowledge. However the metrics are based on Scopus rather than ISI Web of Knowledge (Web of Science) so more business and management journals are covered, and more business and management subject categories. The screenshot below shows results for the subject category Accounting from the subject area Business, Management and Accounting. There is also a category Marketing in this subject area (see Journal ranking – marketing posted August 2012). The subject category Finance is in the separate subject area Economics, Econometrics and Finance. Another major advantage is that the SJR SCImago Journal and Country Rank – Journal Ranking portal is available online – there is no requirement for a Scopus subscription. The CWTS Journal Indicators are also based on Scopus data, and 2012 is now the latest available. CWTS provide the SNIP indicator (source normalized impact per paper) that corrects for differences in citation practices between different scientific fields. Journal ranking – 2012 JCR – (posted June 2103) the ISI Web of Knowledge (Web of Science) Journal Citation Reports – latest year 2012. The ISI Web of Knowledge Journal Citation Reports (2012 JCR Social Science Edition) is now available. select Additional Resources and then Journal Citation Reports. 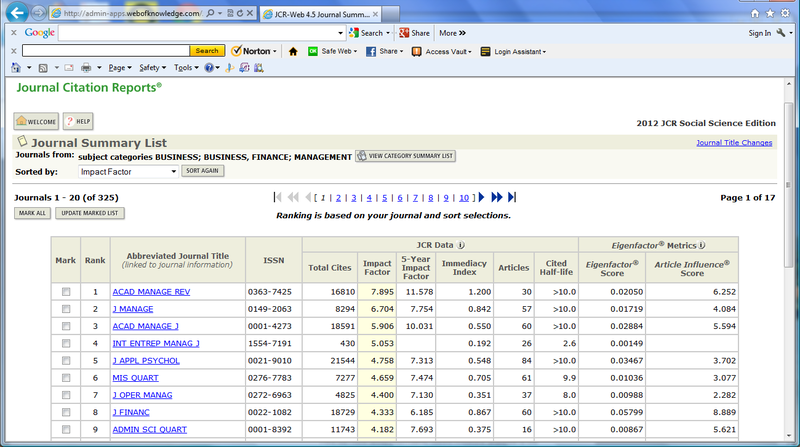 The screenshot below is of the 2102 JCR Social Science Edition for subject categories: Business AND Business, Finance AND Management sorted by Impact Factor. Thanks to the Academic Trends and Innovation (INSEAD) blog for their post – Top 10 journals by impact factor – Latest JCR is released. Recently “journal ranking 2012” has been a popular search term on Business Research Plus so many people will be glad that these are now available. 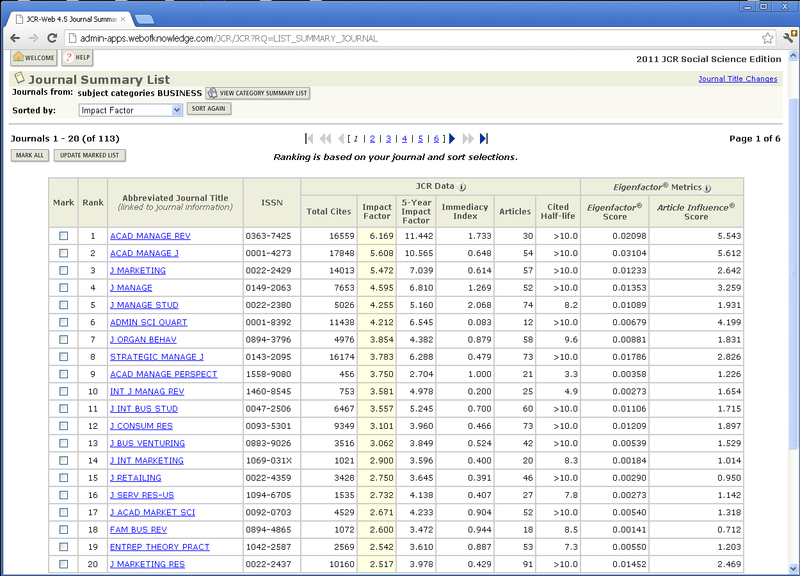 The journal ranking data for 2012 is the latest available. Like previous years, the Journal Citation Reports (2012), including Impact Factors 2012, became available around the end of June 2013 – see journal rankings – 2012 JCR. The ISI Web of Knowledge Journal Citation Reports (2011 JCR Social Science Edition) do not have marketing as a separate category, but Journal of Marketing, Administrative Science Quarterly, Journal of Consumer Research, Journal of Retailing and Journal of Marketing Research are all in the top 20 for subject category Business ranked by Impact Factor. 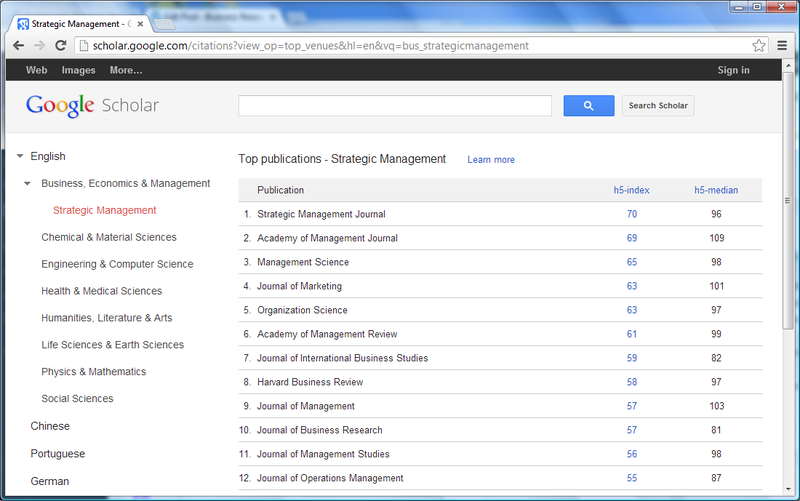 Also from Journal Citation Reports (2011) Top 10 journals in Management, Finance and Economics from INSEAD blog. Eigenfactor claims to rank journals in a similar way to Google ranking websites. Eigenfactor ranking for ISI category Business – there is no marketing category but several marketing journals are at the top of this category.